I am new here and have been scouring the net looking for info on starting a salt water aquarium. I have had numerous fresh water tanks in the past, but have always wanted a SW! Now I have read a lot of confusing information. Everything from dropping fish in a bucket of pre-mixed salt water to extremely expensive systems. I want a small tank with small fish. How small can one go? I would like something in the 10-20gallon range with fish no larger than 3in or so. Id love to have crabs and shrimp as well. Is it possible to have a small tank system like this and do so without dropping hundreds of dollars to do so? So I guess what I am getting at is, can I get a 10-20 gallon SW tank going for under 300$? Again, I want it kept simple (for now). No coral or large exotic fish. (Just a couple fish really). I plan on having living rock, some hermit crabs, and some small fish. Seems the actual tank is the most $$$ thing seeing as most the pet stores around here sell acrylic ones now. So, can the KISS principle hold here? Or is it just unrealistic? Is their a reason besides cost to go for a small tank? If you can, go on a local reef forum. Their is most likely a tank for sale cheap. It`s been done before but IMO it will be harder. Less water volume is less forgiving should you have any problems. Fish wont cost much as I have several stores around here with alot of them. Sadly, their tanks cost hundreds (even for a 20gallon). If I go with a 20 gallon glass, that should fit the budget. So, am I crazy? A salt water tank for under $300? No a salt tank for under 300 is do-able. Probably going to be close though. Like the other have said it is going to be difficult to maintain a tank that small. I am always concerned when people new to salt want to start that small because the risk of having a bad first SW experience and contributing to the rumor of SW is so difficult to do. I personally think that a 75 is a good place to start for SW. Craigslist will be your friend here. Because of the economy there are a ton of people getting out of their larger tanks right now. I would guess that if you keep your eyes open you could find a tank and stand with some equipment even for 200-300$ I don't think you will be able to set the whole thing up for that much but it wouldn't take a whole lot more and i think it would be worth it in the long run for you. I wouldn't ,however, buy someone elses live rock or fish. Buying thier system also buys their problems. I started my 40g about 4 months ago. The tank is only a small piece of the money. The lights are the top money item and then the live rock. IMO, find a lighting system you like then buy the tank to fit it!! 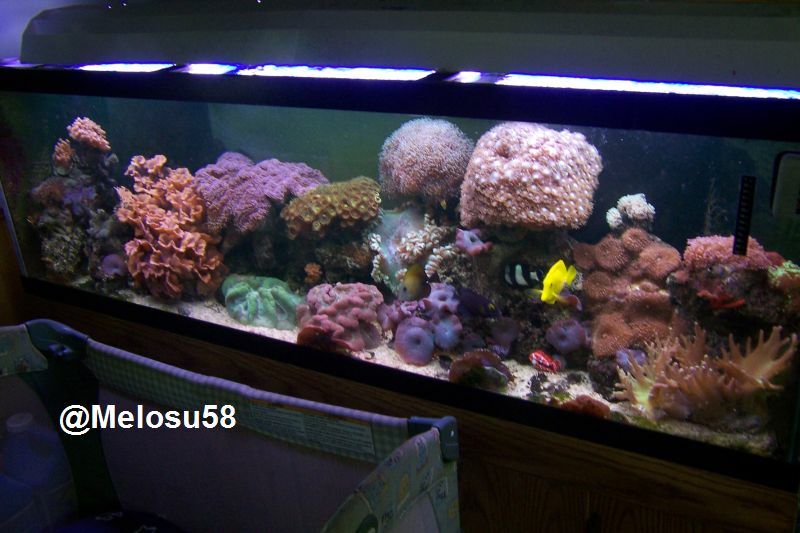 Do you want corals or just fish? Also you can save money by buying base rock and seed it. He wants only fish and rock from what his post says. Again it is doable. Taking the long route of using base rock and allowing it to mature to grow the required bacteria will save you plenty in itself. Yes, just fish, rocks, and how about some crabs? I love hermit crabs. So, I dont want to go as cheap as possbile and deal with stuff that breaks or messes up all the time, but I also dont want stuff that will "pamper" the tanks creatures. Coral is out of the question as I dont want to spend $$$ on the bulbs. So as I see things, here is how I plan to start: Get tank, protein skimmer, heater+thermometer, water test kit stuff, and some salt water mix. Oh, and then theres the filter and water pumps? Yea, I will deffinately have to get a GLASS aquarium! (This sounds to be adding up fast!). Would a hexagonal shaped tank pose any problems? I am not sure what kind of light will fit or how I would hook up a protein skimmer and pump though.